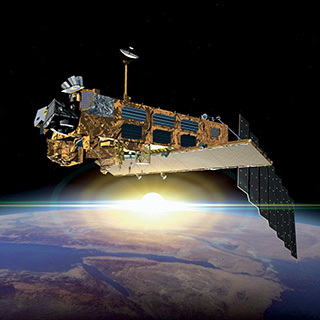 The Envisat mission was launched in March 2002 for 5-year nominal lifetime. Consequently the on-board hydrazine capacity was designed for a 5-year duration operation. Careful management of the satellite orbital manoeuvres allowed saving enough hydrazine for operating nominally Envisat for an additional 3.5 years, i.e. until end 2010. The operations of the Envisat satellite beyond end 2010 require modifying the orbital characteristics of the mission. Careful trading between all possible options led to the selection a new orbit, called the “Envisat Extension Orbit“. The Envisat extension orbit will be implemented through an altitude decrease of 17.4 km which will be reached through different orbital manoeuvres starting on 22 October 2010.